For NextGen Mobiles – You would be familiar with the Qualcomm Snapdragon Processors, or Exynos by Samsung or the Apple A series processors. But ARM is the company that fuels the technology which makes these processors possible. ARM is a British multinational semiconductor and software design company. It is owned by Japan’s Softbank. Besides, SoftBank is the largest shareholder in Indian e-commerce giant Snapdeal and in several other companies. The new Cortex-A75 and Cortex-A55 processors come with a technology called DyanmIQ. The DynamIQ is really intriguing as it allows the Higher A75 cores to to pair with the lower power A55 cores in a single cluster. Earlier Processors like a Snapdragon 810 was using 4 Cortex-A73 Cores in a cluster and there is a second cluster of A53 cores. In the next Gen processors, there is no such restriction. Moreover, the processor manufacturers can use a Single A75 Cortex Core and 7 smaller Cores. Or can use 2 Cortex-A75 and remaining 6 as A75 Cores. The High-performance Cores do the intensive tasks and the energy efficient Cortex A55 Cores perform the low power tasks. The DynamIQ big.LITTLE architecture will help companies make processors which can drive better performance for mid-range devices with use of few high powered cores and manage the cost as well. The ARM Cortex-A75 processor is the latest processor unveiled by the company ahead of the Computex. Probably AMD, Nvidia, and Intel will showcase some future desktop computer processors at the event. Notably, the Cortex-A75 is the successor to the Cortex-A73 chipsets used in most high-end processors by Apple, Samsung, Huawei, Qualcomm, and MediaTek. The Cortex-A75 processors come with best power efficiency and performance that mobile processor can offer. The new processor comes with DynamIQ technology which will enable AR, VR, and machine learning. The new processor comes with 20% more integer Core performance in comparison to the last gen.
ARM’s marketing head John Ronco says that the new Processors can deliver up to 50 times the performance benefit for AI-based applications which need to do computing on the device with these new processors. AI and machine learning is the next big thing in Tech. Even the Google’s recent I/O 2017 was all about it. Moreover, with the use of Siri, Bixby or Amazon Alexa, there is a greater need for onboard processor support to enhance the real-time performance of virtual assistants. Most current AI’s use the cloud-based computation engines to share the results. However, in future, some tasks will be performed on the device itself using the new ARM cortex cores. The new Architecture not only helps with the machine learning and AI but also has superior branch prediction to improve performance and data prefetching. The architecture of the Cortex-A75 cores is ARMv8-A (Harvard). Additionally, the maximum number of cores that it can use in a cluster is 4. With L1 Cache – 64 KB, L2 Cache 512 KB while the L3 Cache can go up to 4 MB. 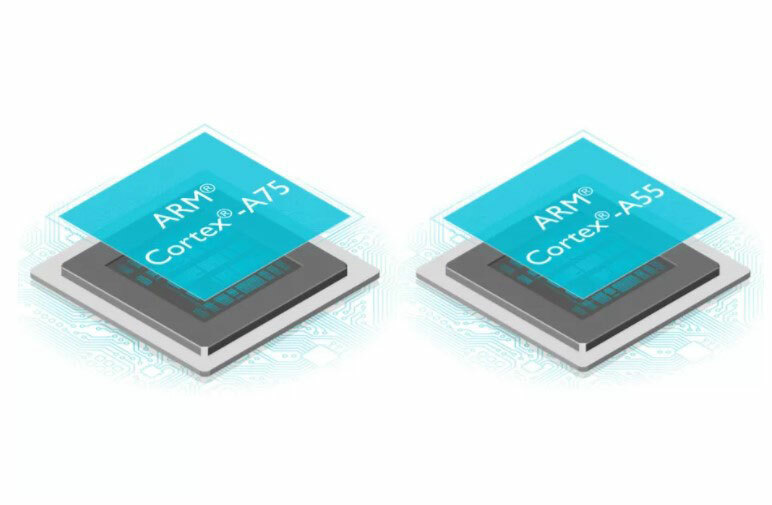 The Cortex-A55 processors are what we will see in most of the next generation of low and mid-range phones. 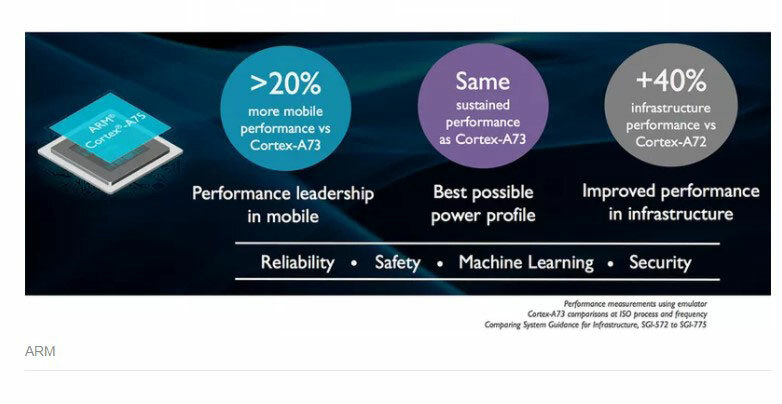 The Cortex-A55 offers 10 to 30% boost in performance in different applications. The processor will offer up to 18% better power efficiency, boosting the battery life of smartphones. It also comes with 15% increase in single core performance which can help boost the gaming performance along with the GPU. The Cortex-A55 also has the same DynamIQ technology and features the latest ARMv8-A architecture. 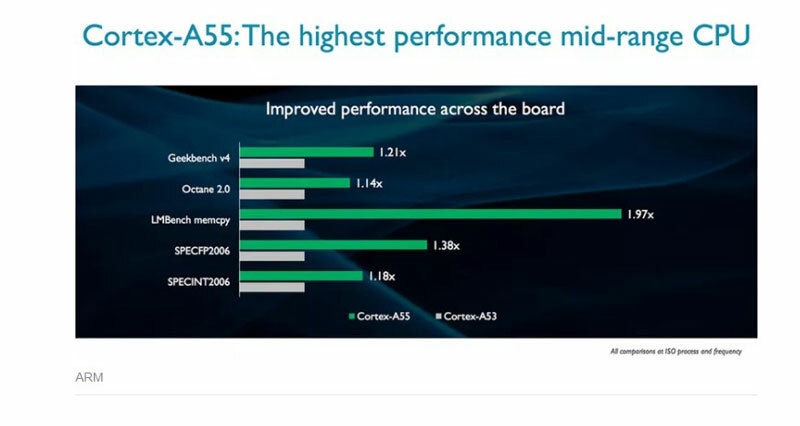 Manufacturers can use the Cortex-A55 as a standalone processor in the phone or along with the Cortex A75 cores in the big.LITTLE architecture. Also, it offers the biggest boost to the memory performance with over 200% gain vs the last generation of Cortex-A53 processors. Mali-G72 GPU is the successor to the mali-G71 GPU which comes with the Exynos 8890 (Samsung S8). Additionally, it offers up to 40% performance boost in terms of gaming performance and also helps with improving performance for machine learning applications. Also, the GPU comes with Bifrost technology and has 25% higher energy efficiency. Further, it comes with 32 shader cores and has a frequency of 850 MHz. The GPU now has support for 16X Multi-Sample Anti-Aliasing. Moreover, it supports Vulkan API, DX 12 and Open GL up to version 3.2. The GPU uses 16 Nm manufacturing process. The new set of processors and GPU are intriguing as they open up more space for technological advancements with improvement in all areas including AI, Gaming, camera performance and general performance of mobile computing devices. You can also read about the new Apple A11 processor which decimates the Qualcomm processors.